Protest against the UK's arming of Israel. 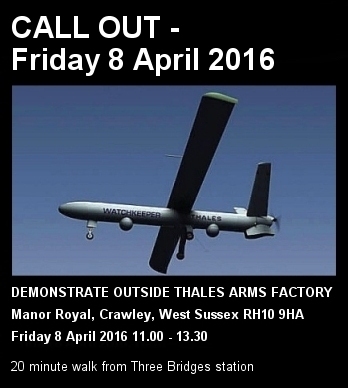 Thales Arms factory, Manor Royal, Crawley, West Sussex RH10 9HA. Thales (UK) works with the Israeli arms company Elbit Systems to develop the Watchkeeper drone, modelled on Elbit's Hermes 450 drone used extensively over Gaza. 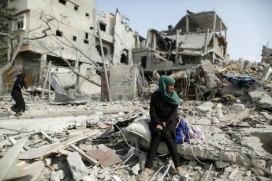 Thales is complicit in Israel's war crimes against the Palestinian people. 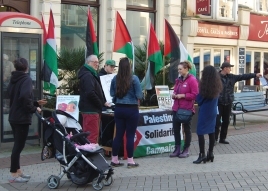 Organised by Sussex Stop Arming Israel. Hastings PSC supports the protest and we are looking forward to a good turnout. Annual 'Open Shuhada Street' Campaign. 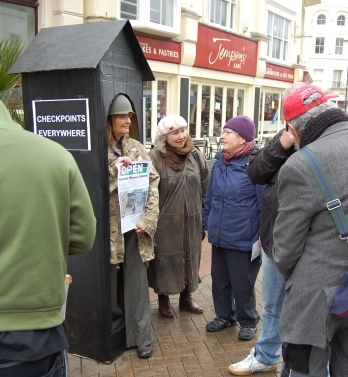 Thanks to everyone who supported our activities in solidarity with the people of Hebron, particularly visitors to our 'checkpoint' in the town centre, and everyone who came to the meeting with Alwyn Knight and John Lynes. Hebron has born the brunt of Israel's increased violence, attacks and murders against Palestinians (many are children) since October. There were solidarity activities throughout the world. Photo of our 'checkpoint' appeared on the facebook page of Hebron's Youth Against Settlements. 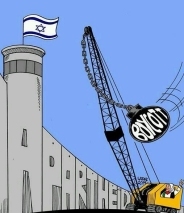 Antisemitic? Or just against the Israeli government's oppressive actions? After Oxford University's Labour Club support for Israeli Apartheid Week, there were the predictable claims of "anti-semitism" from pro-Israel politicians. A selection of letters published in the Guardian showing how these critics are deliberately confusing antisemitism with anti-Zionism. Guardian letters page. Palestinian Hanan al-Hroub winner of the Global Teacher Prize. Hanan al-Hroub grew up under Israeli ocupation in the Dheisheh refugee camp near the West Bank city of Bethlehem. 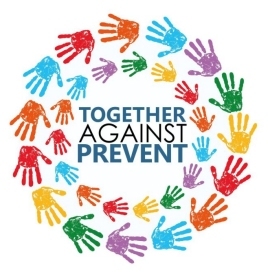 The methods that earned her worldwide recognition emphasize teaching nonviolence through play as a means of helping children traumatized by exposure to violence. 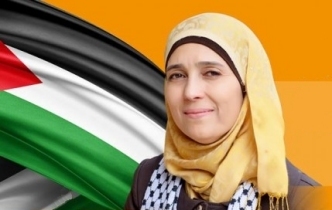 World's top teacher motivated by trauma experienced under Israeli occupation. McGraw-Hill destroys textbook to placate pro-Israel critics. The publisher McGraw-Hill destroys all copies of a textbook which shows the dramatic theft of Palestinian land since Israel's foundation. McGraw-Hill destroys books after anti-Palestinian campaign. Fund raiser: to provide psycho-social support to children in Rafah. To train 18 new volunteers to provide psycho-social support to the children in Rafah. Almost every child in Gaza has lost someone they love. Many are traumatised. There are 2 crowdfunders, one set up by the centre at Rafah, Gaza. Also the crowdfundraising by Nadine Marroushi (who gave readings of Mahmoud Darwish's poems at one of our Coastal Currents events) - it includes the opportunity to buy Nadine's wedding dress to raise funds. Please feel free to contribute to either - or both! 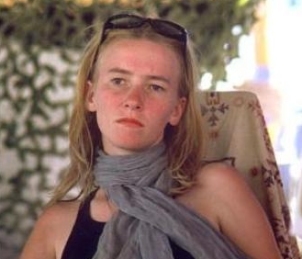 It's 13 years since the Israeli military killed Rachel Corrie. It's important to remember the life of this brave and principled young woman. This article shows how Rachel's work has inspired others to take up her work in supporting the Palestinian people in their fight for justice. A useful article showing the background to Rachel's death written by the International Solidarity Movement. Dabka in the port of Gaza. We run the information stall every Saturday 12.00 'til 14.00 (2 pm) in Hastings Town Centre opposite Lloyds Bank. Please come along to say hello and support us. You don't have to come every week or stay for two hours but any time is appreciated. We welcome new members! Becoming a member of Hastings PSC is an important way of supporting our work.The annual subscription is £10 waged, £5 unwaged. We haven't an online system as yet, but please fill in our membership form and mail it or hand it in at one of our information stalls or meetings. Download form here. Southampton University bans "controversial" Israel conference again. Academics tell the university of their intent to challenge the latest ban in court. Article here. The crowdfunding campaign: Freedom of Speech for academics. UK Israeli embassy war-room battle plans against BDS movement. Teachers to debate scrapping Government-led counter-terrorism policy amid fears it is fuelling attacks on youngsters. See our February 2016 newsletter.